Hopefully this was incompetence rather than malicious intent. This is definitely not a PPC parking page. Manufacturing company Robert Bosch GmbH has been found (pdf) to have engaged in reverse domain name hijacking for bringing a UDRP cybersquatting complaint against Tucows over the domain name bosch.net. Looked at in the best possible light, this was due to extremely inept lawyers. Bosch.net is one of Tucows’ domains in its RealNames portfolio. RealNames offers email addresses at surnames. 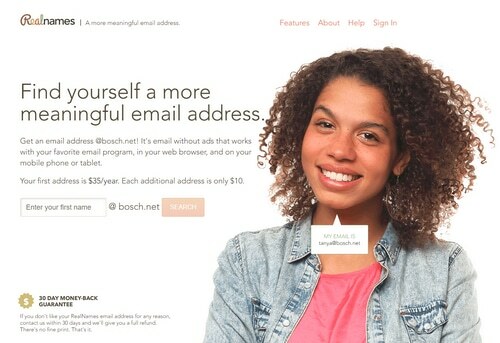 For example, if your name is Jeff Bosch, you can use jeff@bosch.net for a fee. It is also clear that the Respondent is using the domain “www.bosch.net” as a Pay-Per-Click website that links consumers to various goods and services. On entering the search term ‘www.bosch.net’, the user is directed to spam links offering virus contents in such links. It is obvious that the Respondent is trying to create confusion in the market by wrongfully representing that the Complainant, being in the automotive industry, are involved in such businesses. This is untrue. Why did the complaint state something so obviously untrue? Well, Tucows’ attorney John Berryhill noted that Bosch selected representatives based in India to act for it in filing the Complaint even though the case has nothing to do with India. He suggested this is because India is a jurisdiction where legal counsel cannot readily be held to account for making untrue statements. The only real possibility the Panel can envisage that was not the result of a deliberate decision to mislead, is an incompetent “cutting and pasting” of the relevant text from an earlier complaint with different facts. I’m going to go with the latter here. It is also in the Panel’s opinion appropriate to note that if the Complaint had included these types of allegation as a result of some sort of mistake, the Panel assumes the Complainant and/or its representatives would have realised this mistake when they saw the Response, which presumably they have read and considered. It would have been possible at that stage to take steps to withdraw the serious and misplaced allegations that the Complaint makes. However nothing was done. I hope this is a case of lawyers not relaying their error to their client. Or not paying attention.